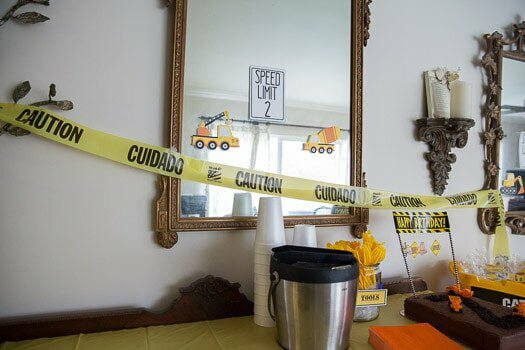 Bug’s second birthday was a couple weeks ago and we decided to throw him construction birthday party! 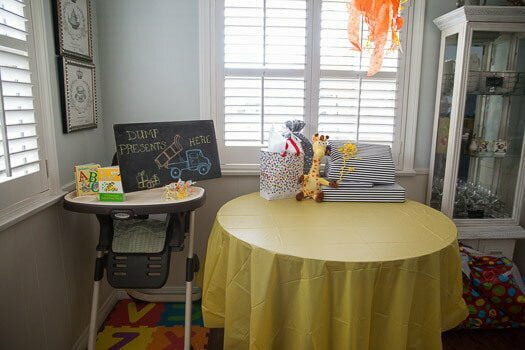 I know he won’t remember these parties at all at this age, but I have so much fun creating all the decor and planning the party. 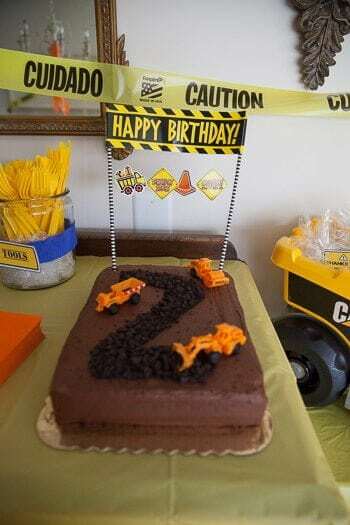 So I went all out for his second birthday again. I will admit that this year was a little harder with being 8 months pregnant. 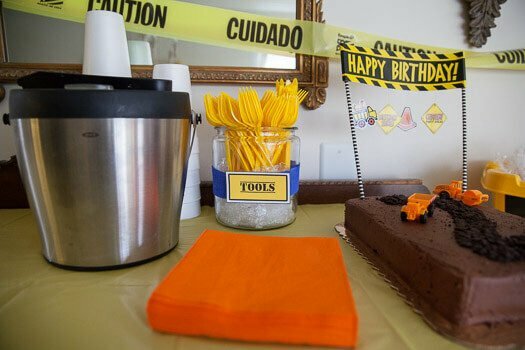 But I think his party came out perfect. Originally, we were going to have it at our house in the backyard. We ordered tables and chairs and a bounce house. Then it rained all day before the party and was 100% chance of rain for the day of the party. So we moved the party up the street to my mom’s house. Thankfully they live so close. 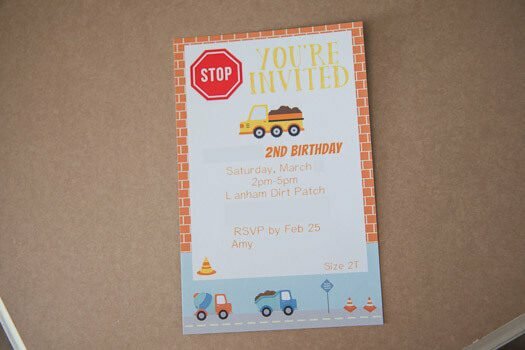 These are the invitations we sent out! You can find them in our Etsy Shop. I think they are so cute and they match the Thank You cards at the end of this post that you can get for free by signing up for our VIP list! 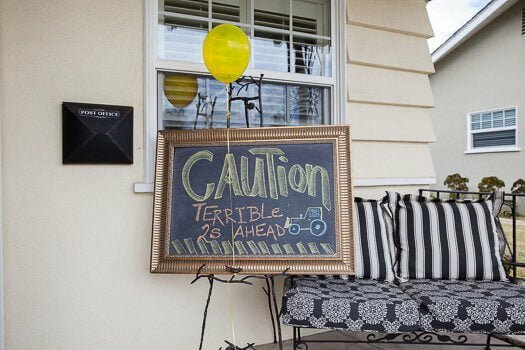 My mom decorated the chalkboard signs to tell people where the party was and where to dump presents. I bought the cake from Albertsons. We actually love their cakes! They are always so delicious. I just bought a plain white cake with their chocolate buttercream and told them not to decorate it. I printed out a big 2 on my computer and cut it out to use as a template. Their frosting isn’t sticky at all, so I was able to lay the paper on the cake and then sprinkle the crushed up Oreos into the template. I found the Happy Birthday sign at Hobby Lobby and the little toys were from the Dollar Tree. 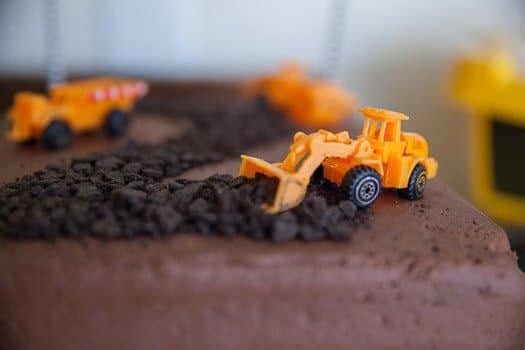 As soon as Bug saw his cake all he wanted to do was play with the trucks! We used a lot of toys that we already had around the house. 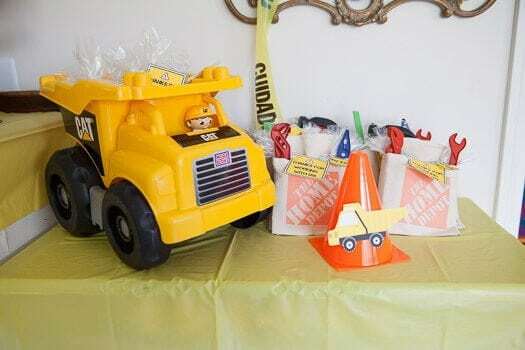 The big CAT truck we used to hold party favors for the adults. 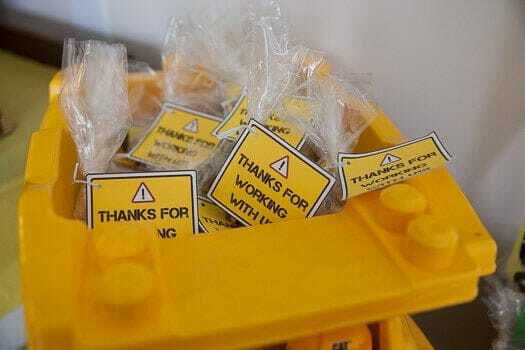 It’s Reece’s Pieces and Whoppers as boulders and pebbles with a cute tag that says “Thanks for working with us”. 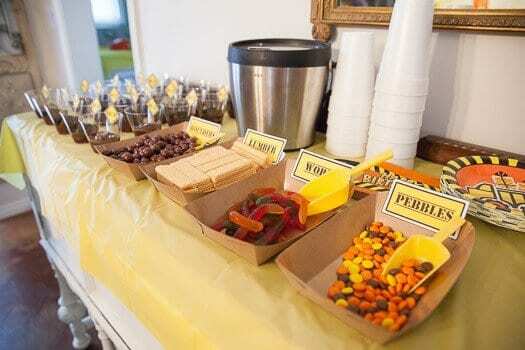 I also made some favors for the kids that came. We found these adorable Home Depot toolbelts for $0.97 each. I bought the tools at the 99 Cent Store. 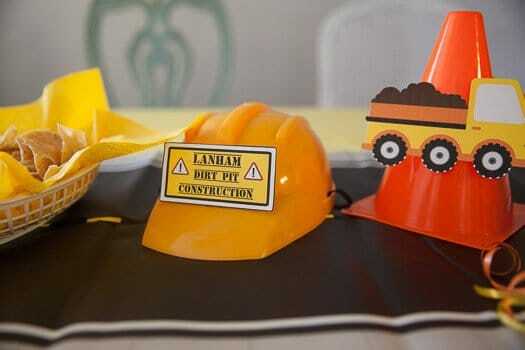 They came with hats for the kids too that we used as decoration on the table. 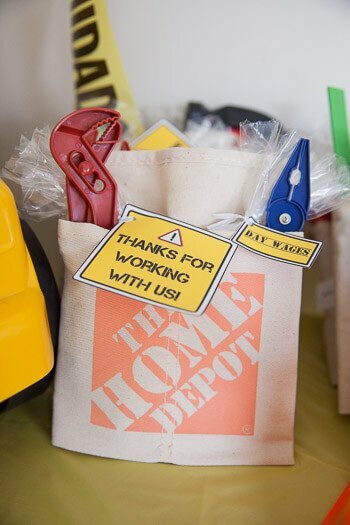 Each kid got two tools, the toolbelt, chocolate gold coins with a tag that said “day wages” and then the same candy the adults were getting with the “Thanks for working with us tag”. 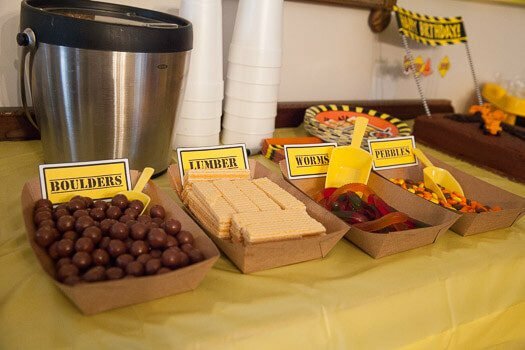 They were a big hit at the party. All the kids loved the tools! We had a wide range of ages from 2-10 and they were all happy with this favor. Since I’m very pregnant, we decided we didn’t want to try to cook for everyone. So we decided to get a taco person. She’s amazing. She makes the tacos right on site and they are delicious. She brought chips and salsa for the tables too. So we had four types of meat for the tacos, quesadillas, chips, and salsa. It was so easy! I didn’t have to worry about cooking or clean up and everyone loved the tacos. 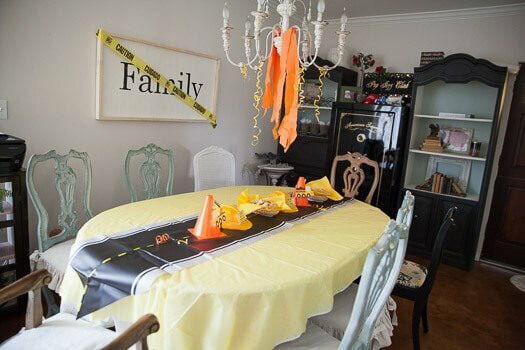 We’ve talked about doing this for every birthday party because it’s just so much less stressful! Because it decided to rain, we had to cancel the bounce house. 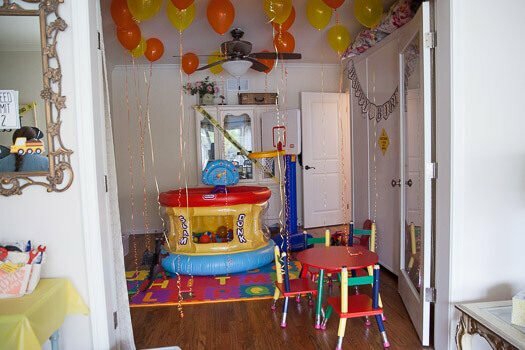 So instead we made this room into the kids ‘playroom’. I bought balloons from Albertsons. I only bought 20, I wanted to get more, but balloons are expensive! We put a couple select toys out for the kids, like the basketball hoop with some squishy balls, the table and chairs for them to eat or play, a barbecue with some pots, and some trucks. But all the kids loved the ball pit! It was definitely the highlight of the room and they all had so much fun. For dessert, I also made some sugar free pudding. Since I’ve been diagnosed with Gestational Diabetes I’ve been trying to be really good about what I eat. So I knew I couldn’t have cake. We have a couple other diabetics in the family and some people watching their diet. So I figured it would be good for everyone to have some options. I crumbled Oreo on top on most of them, but kept a few with just the pudding. 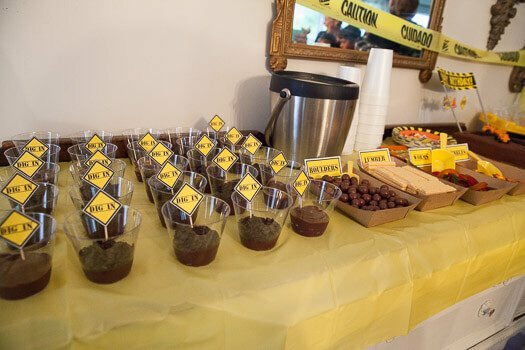 We also had toppings for everyone to top their pudding dirt cups with. Boulders were Whoppers, lumber is those wafers, worms are gummy worms of course, and pebbles are Reece’s Pieces. Everyone had a great time at the party! Especially Bugs. 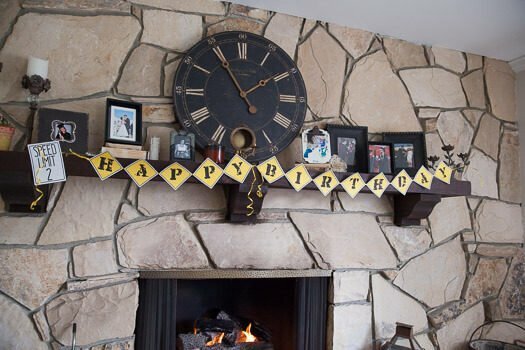 He’s been really into signing Happy Birthday lately. We had like 5 birthdays in the span of a couple weeks, with 4 in one week. So when everyone started singing him Happy Birthday he was over the moon and had the biggest smile on his face. It was definitely worth all the planning. 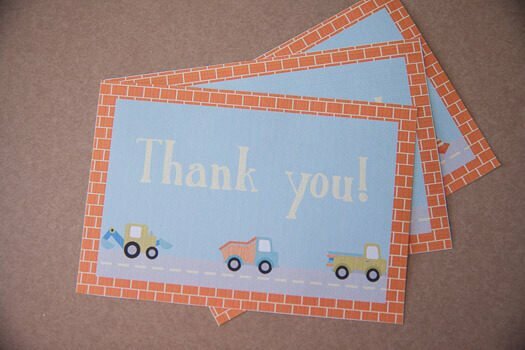 I created these cute Thank You cards to match our invitation and thank all our guests for coming and for the gifts. 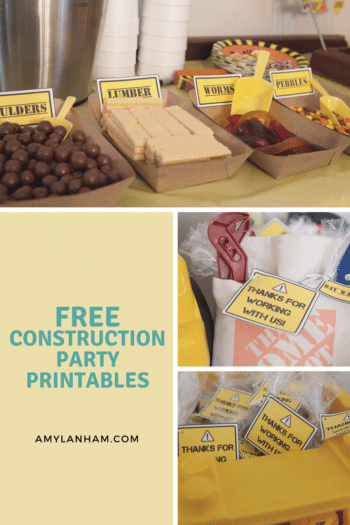 Don’t forget to sign up to our free VIP library to get all the printables featured in this post and so much more!